China’s annual shopping extravaganza doubles as retail therapy for its financially hard-pressed middle class. China’s largest online shopping day turns 10 this year. Since the e-commerce giant Alibaba first launched its “Double Eleven” promotion on Nov. 11, 2009, it’s evolved from a marketing gimmick designed to piggyback off an underground shopping holiday to a standalone consumption binge bigger than Black Friday and Cyber Monday combined. Alibaba alone has seen sales rise from 52 million yuan in 2009 to 168.3 billion yuan in 2017 ($7.6 million and $25.3 billion, respectively). This year TMall, a subsidiary of Alibaba, reported sales of more than 100 billion yuan in less than two hours, and scores of other companies — including Alibaba’s primary competitor JD.com, online food delivery services like Meituan and Ele.me, and just about every one of the country’s major retailers — now offer discounts in honor of the day. 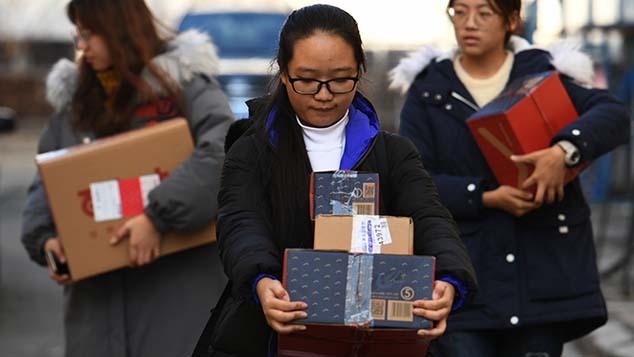 Prior to 2009, Nov. 11 was better known among a certain subset of young Chinese as “Singles’ Day.” Far from being the recognized holiday it is today, it’s said to have begun in 1993 as an inside joke between uncoupled students at eastern China’s Nanjing University. The date — “11/11” — was chosen because of the numerals’ resemblance to “bare sticks,” another word for “single” in Chinese. Over time, Singles’ Day caught on around the country, and young, unattached Chinese started viewing it as a chance to treat themselves to a new outfit or a good meal — an association Alibaba would take advantage of with its own promotions. Although the company got off to a slow start — only partnering with 27 sellers that first year — by 2012, the event was already big enough to merit coverage by the Party-run news outlet People's Daily. Since then, Chinese media has hailed the day as a symbol of China's rising e-commerce industry, a sign of its changing consumption habits, and proof of the country’s ability to innovate. Double Eleven’s success was hardly a given. In 2009, online shopping hadn’t caught on or become the popular pastime it is today. Even Alibaba couldn’t have foreseen how big the day would become; it began as just another of the company’s attempts to lure consumers away from physical outlets and acclimate them to buying goods online. 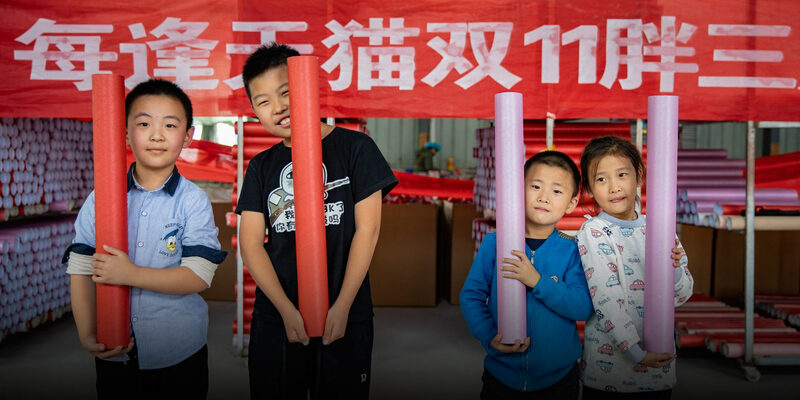 Now, however, as Double Eleven adjusts to its tween years, it faces a very different economic landscape than it did even just a few years ago as retailers navigate China’s ongoing economic slowdown. For weeks leading up to Double Eleven, I’ll hold off on buying anything that can possibly wait. My first Double Eleven purchase was in 2011, when I was a graduate student at East China Normal University in Shanghai. I paid 200 yuan for a hoodie and a pair of jeans — a huge discount — and my roommate ordered a pair of basketball shoes. The next day, on my way to our university’s dining hall, I realized that everyone was talking about what they’d bought on the day. A few days later, the lawn where students typically went to pick up deliveries was buried under a mountain of boxes. Now that I’m out of college and married, my shopping needs have changed, but my reliance on Double Eleven’s discounts hasn’t. I made my shopping list weeks ago, planning on buying enough toilet paper, trash bags, and toiletries to last my family until next November. It’s not quite as hip as a new hoodie, but there’s something satisfying about saving yourself a year’s worth of trips to get toilet paper. For weeks leading up to Double Eleven, I typically hold off from buying anything that can possibly wait, including clothes, snacks, and books. I’m not the only member of China’s financially crunched middle class that thinks this way. For years, the Chinese government talked up the idea of a consumption upgrade, in which Chinese buyers — wallets finally flush with cash, thanks to a booming economy — would loosen their purse strings and start buying more high-end, high-quality goods. It even caught on for a while, but today, the notion seems far-fetched. Skyrocketing housing prices and rental costs have many young Chinese feeling increasingly pessimistic about their savings, and you’re just as likely to hear talk of an impending “consumption downgrade” as a “consumption upgrade.” A friend of mine, Huang Wei, works in the coastal city of Xiamen and represents this very situation. The average salary in Xiamen is about 7,000 yuan a month, while a house can cost as much as 40,000 yuan per square meter. Faced with calculations like that, many feel they have no choice but to cut back, however they can. 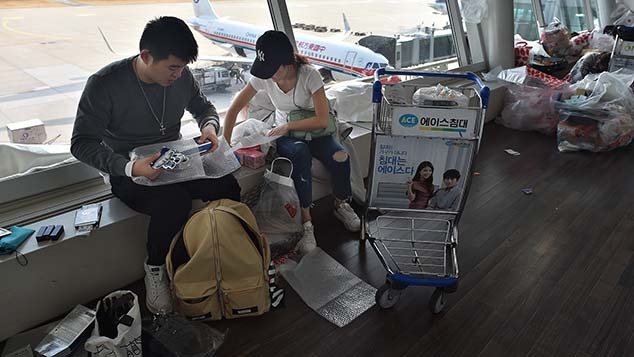 It’s not that young Chinese don’t want high-quality goods. In many cases, consumers are still willing to pay more for quality. But, as the country’s economic position grows ever more precarious and housing ever more unaffordable, many young shoppers want to ensure that they’re getting the absolute best deals possible. Often, that means waiting for major price cuts like those that occur on Double Eleven. Sometimes it’s nice to look around and feel middle class, even if my bank account might suggest otherwise. Amid this wave of consumer negativity, Chinese companies are trying to expand Double Eleven’s shopping mindset to other holidays. These days, it’s commonplace for holidays in China to be commercialized and commodified. You can now buy Starbucks-branded treats for Dragon Boat Festival, floral arrangements for any of the three Valentine’s Days celebrated in China — Qixi Festival, May 20, and Western Valentine’s Day — or elegantly packaged mooncakes for Mid-Autumn Festival. 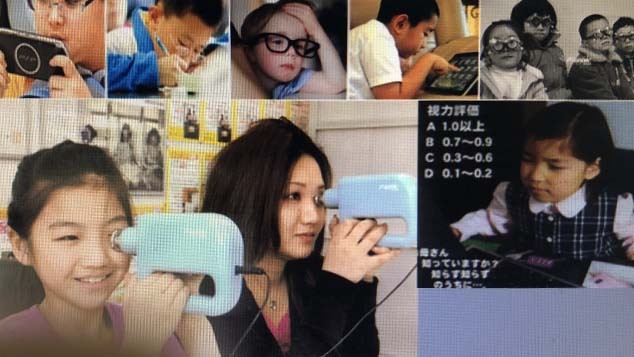 Children’s Day is now as targeted at nostalgic millennials as it is children, and retailers have even tried turning International Women’s Day into “Queens’ Day” and “Goddesses’ Day” with discounts targeting the so-called she economy. It’s as if the solution to problems these days involves buying your way out of them. Want to tell someone you love them? Buy them something. Going through a rough breakup? Buy yourself something. Unhappy with your life? Buy a new one. The truth is, retailers may be onto something. The siren call of consumerism is hard to resist, even — or perhaps especially — in difficult economic times. Economists like to talk about what’s called the “lipstick effect”: When the economy declines, lipstick sales often increase. In times such as these, when we don’t have enough disposable income for the kind of major purchases that can have material impacts on our lives, sometimes it’s still nice to buy something small — like a tube of lipstick. Relatively inexpensive commodities such as these can satisfy our innate desire to consume, thereby giving us an emotional boost. Since I finished graduate school, I’ve consistently taken advantage of Double Eleven’s discounts to buy small knick-knacks for my apartment, such as works of art, vases, and dining sets. Sometimes, it’s nice to look around and feel middle class, even if my bank account might suggest otherwise. The well-known 20th century author Eileen Chang once wrote about how, when people can no longer bear the stress of life, “They seek authenticity in life from daily necessities, soap, water, and sun.” It’s something I can relate to. At times, the high of Double Eleven can feel like a drug. Even now, with economic concerns peaking, few will sit out today’s festivities. It may be a shopping holiday, but Double Eleven’s effects are more than just economic: The day has become a psychological crutch. Buying something on Double Eleven is our way of saying “Everything’s OK,” even when it’s not. As long as that’s the case, retailers can rest easy, at least for one day.